My sense would be that with this kind of joint, you get it close with methods you describe before glue up, but you’ll have to do hand work with rasp, sandpaper, etc. for the final look. Oscillating spindle sander or use a router with a template. 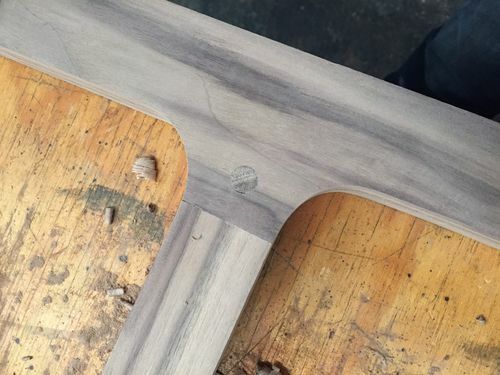 As far as the joint goes, it’s probably just a normal Mortise & Tenon that’s been shaped. I just noticed that prior to this one I have 666 posts. Must be some kind of omen. At any rate, I would second the templates and router comment. One for the top curves and one for the bottom. Spend the time to get it as accurate as possible and then all of the curves will be identical. 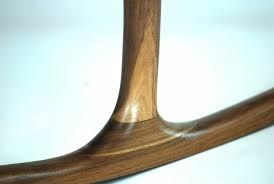 That will work, but I would modify the design a little, such that the legs have some of the curge in them and teh stretchers are straighter – - to have less short grain at the joint, that will want to break off. So more like this to keep max long grain. That’s actually how I’m constructing it…with the little notes that meat the cross members. I bought the rigid oscillating sander this morning and did two legs. I’m pleased with the results. If all goes well, I’ll be making more of these tables and will used a router and template for production work. Thanks to everyone who answered! I appreciate it. I ended up using an oscillating sander. It was a pain. I’d recommend useing a router/table and making a template. I’ll definitely be doing that on all future projects like this. I have a few smaller gaps. probably could have used my shoulder plane a bit more, but I like it well enough. Ah, the dreaded gap that no one else will ever see or notice. I tend to obsess about this stuff, but my neighbor takes a bit more practical approach. He always tells me that anybody in my house looking at the piece close enough to see that gap just needs to go home. Its looking good to me. 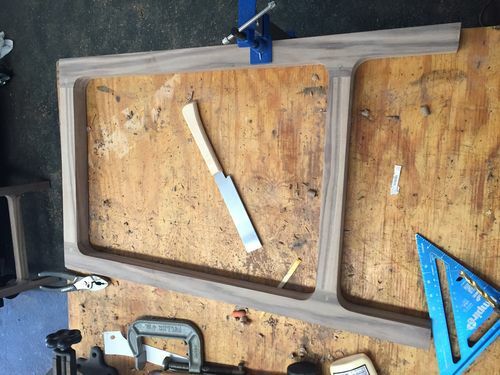 Generally, I use the spindle sander to create the template in 1/4 MDF and then use bandsaw to clear the bulk of the waste and router with the template to clean up.